Boston Celtics forward Marcus Morris (13) grabs a pass against Indiana Pacers guard Victor Oladipo (4) during the second half of an NBA basketball game in Boston, Wednesday, Jan. 9, 2019. There’s no secret to the Boston Celtics recent roll. 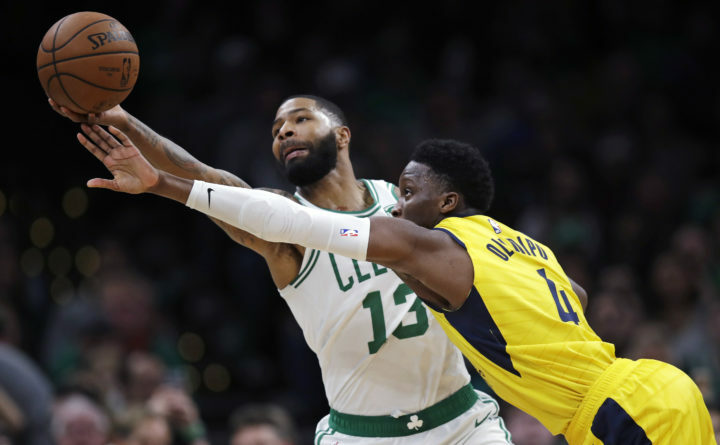 The Celtics continued to share the offensive load, and the results showed again in a 135-113 rout of the Indiana Pacers on Wednesday night for their fourth straight win. “It’s not too often that we’re going to put up 135 points, but I feel like consistently over the last few games, we’ve done a great job of making shots,” said Kyrie Irving, who had 12 points in 24 minutes before getting to rest the entire fourth quarter. The Celtics had 32 assists — their fifth straight game with 30 or more — and put together their highest scoring game this season. Boston (25-15) also ended a three-game skid against the Pacers, who entered the night third in the Eastern Conference having won seven of eight. Marcus Morris had 22 points and eight rebounds, Jaylen Brown also scored 22 points and Jayson Tatum had 20 for the Celtics, who have won five of six. Gordon Hayward had 14 points, Daniel Theis added 12 points and six rebounds off the bench, and Terry Rozier had 12 points and five assists. Indiana used a 10-2 run early in the third and cut the margin to 79-67 on Sabonis’ hook shot with 5:31 left in the period, but Boston took off again and topped 100 points before the quarter was over. The Celtics’ string of 30-plus assist games is their longest since a six-game run in March and April of 1987. Boston’s point total was also the most allowed by Indiana this season — eight more points than Charlotte scored on the Pacers on Nov. 27. Pacers: Tyreke Evans scored 15 points and Kyle O’Quinn had 11. … Bojan Bogdanovic was called for a technical foul with 8:43 left in the first quarter. … Young was called for another technical for saying something from the Pacers’ bench with two minutes left in the third quarter, and coach Nate McMillan got one with 16 seconds left in the period. … C Myles Turner was out with a sore right shoulder. Celtics: Scored 68 in the first half, one point shy of their season-high for points in a half. … Topped their previous high of 133 points scored against Chicago on Dec. 6. … Tatum scored nine of Boston’s first 11 points and had 11 in the first quarter, going 5 for 6. Pacers: At New York on Friday night. Celtics: Open up a three-game road trip Thursday night at Miami.